Last week, I finally did something that I should have done more than a month-and-a-half ago, right when I first came to Paris. It wasn’t going to the Eiffel Tower (been there, done that at least four times during my first month here). It wasn’t buying a black beret, a miniature Eiffel Tower keychain, or a snow globe of Notre Dame on the Seine (so cliché). It wasn’t even eating a crêpe (trust me, I’ve eaten one too many already). And boy, was I missing out. 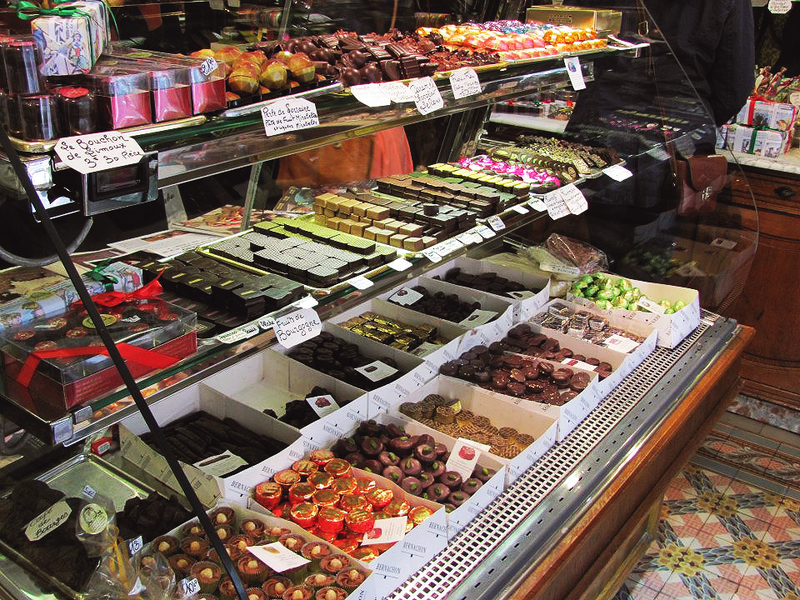 The first fine chocolate and candy store I found online was a little place in Montmartre called À L’Étoile d’Or (With the Star of Gold … or something like that), owned by a woman named Denise Acabo. Coincidentally, a few friends and I had been planning on taking a visit to Montmartre the next day to see Sacré Coeur and to walk around a bit, so it seemed like a perfect enough plan to stop by the little star before making the trek up the steep hills of the colorful northern district. My friends and I met at the Blanche metro stop on that Friday afternoon, and immediately my candy-senses started tingling. “It’s this way. I can feel it,” I muttered to my friends as I dodged through the wild Parisian traffic. “Do you even know what street it’s on, Rachel?” Ella called to me as they struggled to keep up. I didn’t really know exactly … but I could feel it. Sure enough, after a few minutes wandering down a side-street, we found it—a tiny shop window framed by a faded-red canopy printed with the words chocolaterie and confiserie. “This is it!” I said yelled screamed. 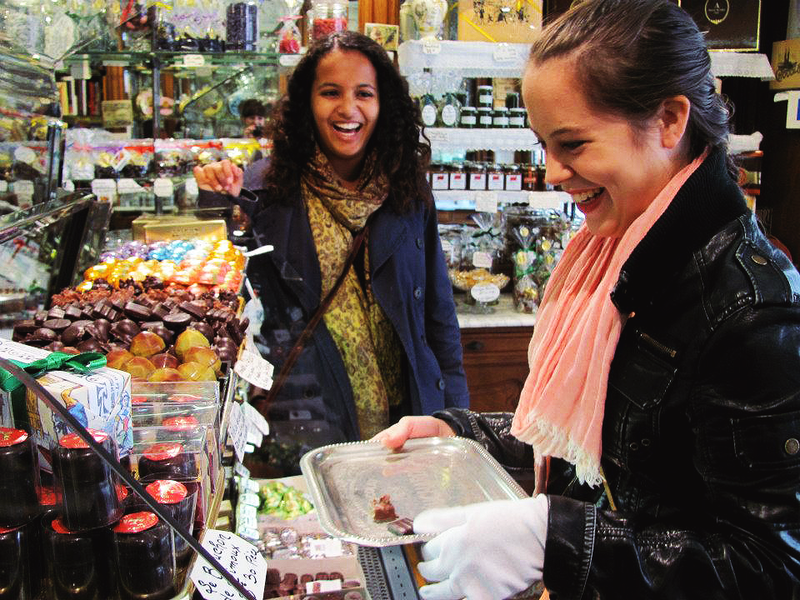 Upon entering, we were met by a delicate, confectionery wonderland. Before I could even get my hands on a piece of candy, I met Denise Acabo, the owner. Tiny, stout, and wearing a kilt and pigtails, Denise rushed over to us and immediately started babbling things in French with a wide, toothy grin and all the candy wisdom in the world glistening in her eyes. “This, here? This is the best chocolate in the world. The true happiness in life,” and “If you’re going to try the caramels, you have to get the honey! It slides down your throat and stays there. You won’t want to eat anything else.” I trusted her, because how can you not trust a woman in a kilt with pigtails? She handed me a tray and a white glove, and I went to town (see the embarrassing picture above). And by that, I mean I picked out five chocolates from the glass case, a piece of pistachio caramel, three nougat pieces (made by Denise herself), and a blueberry jelly square. My friend Ella and I also bought a chocolate bar with hazelnuts to share. The damage done: approximately €18, or $23, from my wallet that I will never see again. However, sitting on the steps of Sacré Coeur with my friends under the host Parisian sun as I devoured my little sugary feast made the huge dole-out well worth it. And even though I’ve already started a list of the best (and most expensive) “Paris candy stores” that Google can offer me, I’m pretty sure that À L’Étoile d’Or is gonna stay at #1 for a long time. 1. Any of the Jacques Genin caramels. Do not leave the store without one. His caramel store is next on my list! 2. One of the Bernachon chocolate bars sitting on the table in the middle of the store. Ella and I bought the “Noisette” (hazelnut), but next time I think I’ll try the “Kalouga” (salted butter caramel). 3. A picture with Denise herself. I didn’t get one, and I regret it. Next time, friends. And maybe I’ll wear some matching pigtails, too. 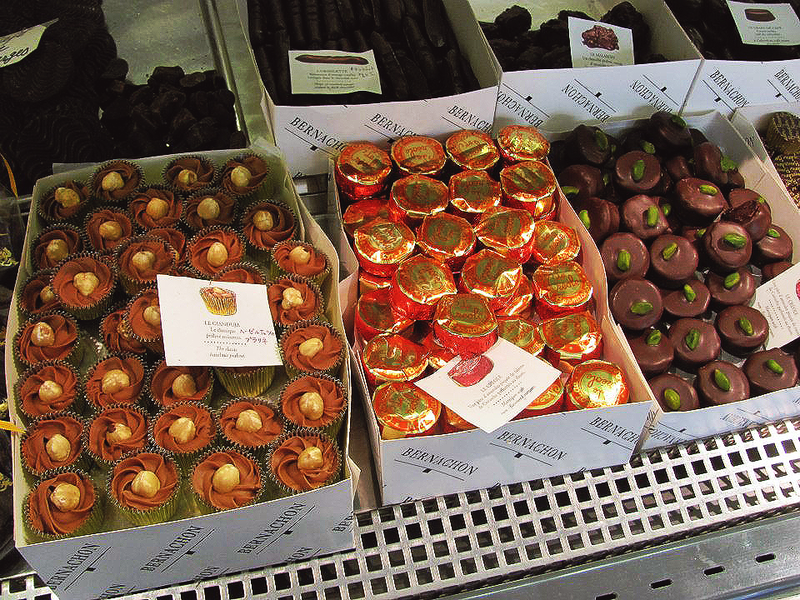 Tags: a l'etoile d'or, bernachon, caramel, chocolate, denise acabo, france, jacques genin, nougat, paris. Bookmark the permalink. My name is Rachel Marchant, and I am the little marching ant. By writing this sweets & desserts blog, I hope to build up my tiny anthill with as many candies, confectioneries, cupcakes, cookies, and croissants as I can. All in a days work, I suppose. Enter your email address below to follow little march(ing)ant and receive notifications of new posts by email. All information, recipes, and photos published on this site belong to me, Rachel Marchant, unless otherwise stated. So ya know what that means? Don't go stealin' my stuff, yo!